There are no set rules as to how long it should take to paint a room or the outside of a property. Much of it will depend both on how many painters will be present, and also the original state of the property before the work commences. That is why it is always important that you don't employ a painter on an hourly basis unless you know them and trust them already. A skilled professional painter should have painted enough properties in various states of repair to be able to work out accurately what the likely costs will be, and consequently how long it should take to finish a particular project. It might surprise you but some decorators will come armed with a calculator and spend two hours going round your home before they leave, promising to send you a quote (also have a look at what the difference between a quote and an estimate is), while others may only take half an hour to look round, spending much of their time scratching their chin. Don't be mistaken, they both know what they are doing, they just have different ways of doing it. Of course you need to have a fairly accurate idea of the time scale of the painting project you have in mind as you have to plan to be around all the time work is going on. 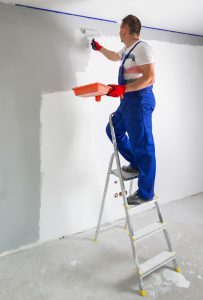 In addition, it is worth sitting down and working out a plan of action with your painter as often they would rather work on more than one room at a time. It makes sense when you think about it that if three rooms need their ceilings painted, then you do all three ceilings one after another while you have the paint and tools at the ready. It is little areas like this where you can help your painter reduce the time taken to do the work, and subsequently be more amenable when it comes to overall costs. Find more information on costs on this page: Prices and Costs.